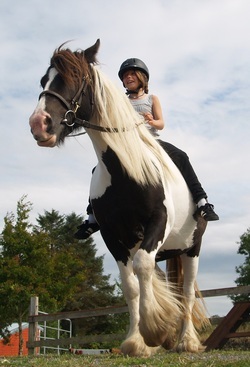 Therapeutic Riding and Care Farming offer a wide range of benefits which can differ from person to person, depending on their level of ability, their reason for attenting, motivation and their connection with the animals. We use a holistic approach where the person is required to use their whole body, thus gaining benefits on a wide range of levels. Some benefits of our work are instant, others gradually set in over time. Building a trusting and positive relationship with the coach and the animals is an essential element towards the success of our work. This can take some time, so we recommend that expectations of a once-off session should be realistic, and that time should be given to the process. We recommend that at least a block of 6 sessions is a suitable timeframe to start building a therapeutic relationship. A person does not necessarily have to ride to achieve the desired therapeutic goals which enhance their physical, emotional, cognitive, behavioural, social and educational skills. Activities around the horse such as grooming and leading the horse and other farm tasks like cleaning out stables, feeding animals, gardening etc. ask for a wide range of motion and motor skills, whilst the company and close contact the animals offer have a relaxing effect on everyone. Below we included a short video filmed in our yard a couple of years ago, where we explain some of the main features and benefits of a therapeutic riding session. The unique motion of the moving horse has many benefits. The companionship a horse offers is unconditional. Learning by experience can have a very positive impact. Who would benefit from Therapeutic Riding and Care Farming? Generally speaking, everyone who is open to the experience can gain from Therapeutic Riding! We use a holistic, person-centred, non-judgemental approach. We aim to overcome some of the barriers that hinder some of us to participate in life to a fuller extent, and offer opportunities to gain more awareness of ourselves and the world around us, and this opens doors to experience life in a different and more fulfilling way. Therapeutic Riding and Care Farming utilises the warmth and softness of the horse and other animals, the horse's unique gait, and the natural environment. It stimulates muscles and senses which some of us don't use often. However low we may feel - physically or emotionally - from the back of a horse, the world looks a different place, and this often has a lasting effect on other parts of our lives.